The use of praise houses by African-Americans began before the Civil War when slaves built simple frame structures for worship on plantations. The term “praise house” is thought to be derived from the phrase “prays house,” or place of prayer. Praise houses were particularly prevalent on the Sea Islands where there were few formal churches. Though slaves sometimes accompanied their masters to parish churches for Sunday services, they were also allowed to worship together on the plantation, and they frequently gathered for worship throughout the week; praise houses served that need. Praise houses on plantations were traditionally quite small – around 14×18 feet – to prevent too many slaves from gathering at once. Owners feared large gatherings because of the possibility of insurrection. After Emancipation, freedmen continued the tradition of erecting such buildings near the plantations where they once lived, often giving the structures the name of the plantation or its owner. The Mary Jenkins Community Praise House on St. Helena Island is one such place, named for nearby Mary Jenkins Plantation. Built around 1900 by Kit Chaplin, this praise house is one of three remaining praise houses on St. Helena Island, including the Croft Plantation Praise House and the Coffin Point Praise House. In 1932, 25 praise houses were known to be active on the island. Singing was an important element of services held in praise houses, which differed from churches in their more informal nature. Services in praise houses usually included call-and-response songs known as “shouts,” and a ringing bell from the praise house would notify community members of births, deaths, and calls to worship. The buildings were used outside of religious practices as well, serving as gathering places for the black community for meetings and other events. 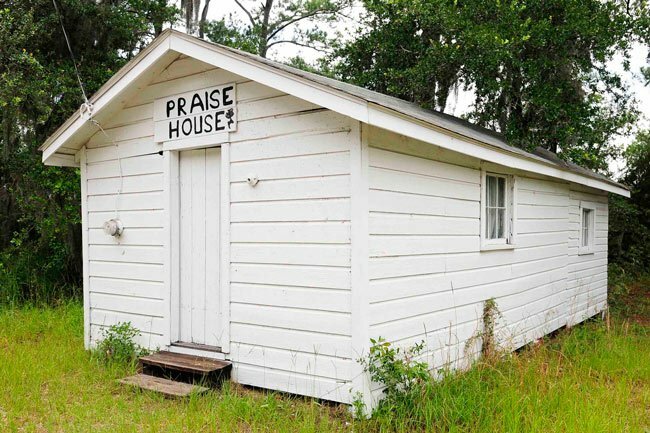 Today extant praise houses are rare, though most are still in occasional use. Moving Star Praise House on Johns Island still holds special events, usually singing concerts. The Mary Jenkins Praise House is also used for events and services and is maintained by neighboring Ebenezer Baptist Church. The Mary Jenkins Community Praise House, built ca. 1900, is one of four known extant praise houses on St. Helena Island [one has since been removed – today there are only three praise houses on St. Helena Island]. Praise houses were first established on St. Helena plantations in the antebellum period, as slaves used small frame houses or other buildings as places to meet and worship. After they became freedmen, they built praise houses on or near the old plantation, in most instances calling their community by the name of the former plantation or plantation owner. Although the extant praise houses date from ca. 1900, their function has persisted since before emancipation and the basic architectural form has been retained. Since there were, and are, few formal church buildings on St. Helena, most islanders could only walk or ride to the main church on Sunday morning. For other community meetings or services, praise houses were built in each of the communities created by the former plantations, and services were held on Sunday, Tuesday, And Thursday nights, as well as the Watch Night Service each New Year’s. 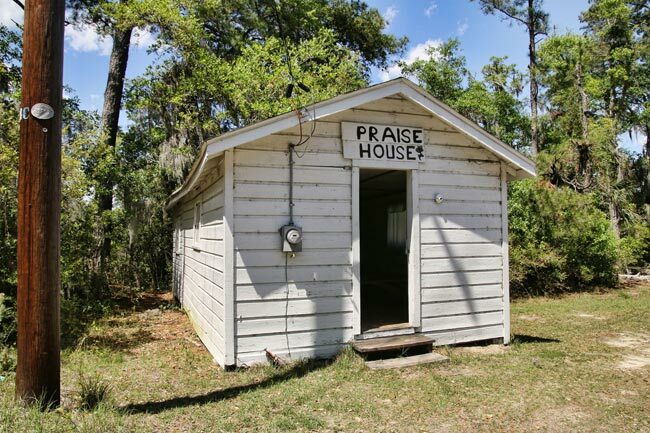 A typical service might consist of singing, prayer, perhaps a member’s testimony of a religious experience, and almost always ending with a “shout.” Kit Chaplin built this praise house ca. 1900; Paris Capers, born in 1863, was one of the early elders. Members of Ebenezer Baptist Church still attend services here today; a cow bell, which is still in the praise house, has been rung for many years to alert the members to a service or meeting.